Samantha would indeed be a happy woman. Her last film ‘Super Deluxe’ released on the 29th of March and has opened to a splendid response from the audience. Her performance in the movie is receiving a lot of love from the audience. Meanwhile, she is gearing up for her next film, ‘Majili’. It has Naga Chaitanya playing the lead, along with Divyansha. The trailer of ‘Majili’ released recently and is receiving a positive response amongst fans and audience. The latest news is that the team of ‘Majili’ had reached Tirupati yesterday(1st April) to visit the Tirumala temple. 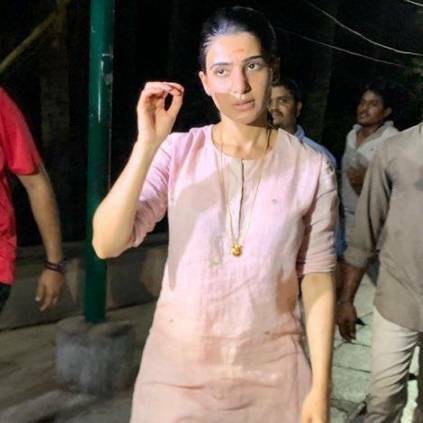 Samantha got down at Alipiri and took the footpath along with other devotees to reach Tirumala. The team will be having a pooja today(2nd April) at the temple. Pictures of her walking the footsteps are going viral on the internet. ‘Majili’, directed by Shiva Nirvana is a cricket-based romantic drama and is produced by Sahu Garapati and Harish Peddi under the banner Shine Screens. The movie is all set for a release on the 5th of April. People looking for online information on Majili, Naga chaitanya, Samantha ruth prabhu will find this news story useful.